Fact of anything: Nathuram Godse was arrested moments after shooting Gandhi, and was taken to the nearby Tughlaq Road police station. 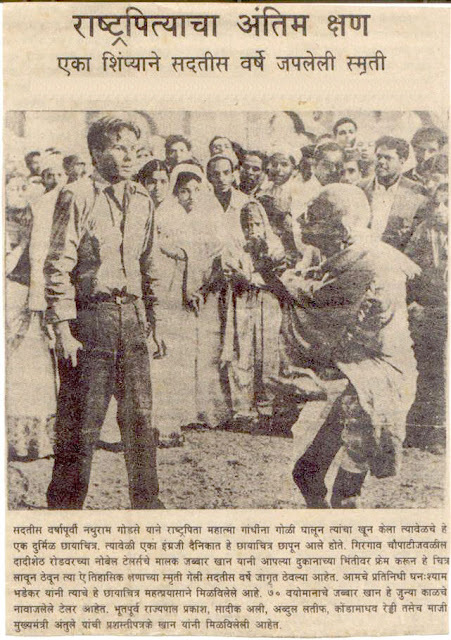 Nathuram Godse was arrested moments after shooting Gandhi, and was taken to the nearby Tughlaq Road police station. On 8 November 1948, he was allowed his day in the sun when he rose to make his statement. Reading quietly from a typed manuscript, he sought to explain why he had killed Gandhi. His thesis coveredninety-pages, and he was on his feet for five hours. Godse's statement should be quoted extensively, for it provides an insight into his personality. The official date for the handing over of power was fixed for June 30, 1948, but Mountbaten with his ruthless surgery gave us a gift of vivisected India ten months in advance. This is what Gandhi had achieved after thirty years of undisputed dictatorship and this is what the Congress party calls 'freedom' and 'peaceful transfer of power'. The Hindu-Muslim unity bubble was finally burst and a theocratic state was established with the consent of Nehru and his crowd and they have called it 'freedom won by them with sacrifice' - whose sacrifice? When top leaders of Congress, with the consent of Gandhi, divided andtore the country - which we considered a deity of worship - my mind was filled with direful anger. One of the conditions imposed by Gandhi for his breaking of the fast unto related to the mosques in Delhi occupied by the Hindu refugees. But when Hindus in Pakistan were subjected to violent attacks he did not so much as utter a single word to protest and censure the Pakistan Government or the Muslims concerned. Gandhi was shrewd enough to know that while undertaking a fast unto death, had he imposed some conditions on the Muslims in Pakistan, there would have been found hardly any Muslims who could have shown some grief if the fast had ended in his death. It was for this reason that hepurposely avoided imposing any conditions on the Muslims. fact of "Dharavi Slum Mumbai"
A History about "The atomic Bombing of Hiroshima"